Frank started his farming operation with absolutely nothing...he even joked that his first farm implement was a shovel, and that it was borrowed. Once the nursery was profitable, he began to purchase surrounding land, and plant the leftover trees from each nursery onto the newly purchased land. Over time Frank was able to purchase and develope an additional 80 acres of land, bringing the total up to 90 acres of citrus. He also built his own home, which took five years to complete. It was during these years that he helped test and develope markets for the new varieties of citrus he was in the process of growing. One of the varieties he was most proud of was the Chandler Pummelo. 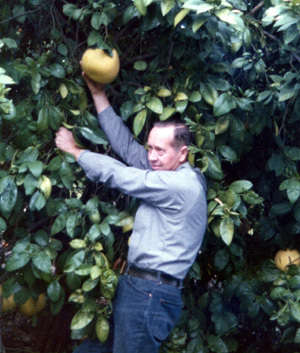 In 1961 he received budwood for over seven varieties of Pummelo. It took over ten years and much trial and error for him to determine that the Chandler was the one variety that held the most promise. He continued to experiment with other varieties, such as the Cara Mandarin, Page Mandarin, Nova Mandarin, several Blood Orange strains, Pummelo hybrids, Cocktail Grapefruit, and Star Ruby Grapefruit, just to name a few. Frank also tested many rootstock varieties, and even had one strain of his own, Terra Bella Citrummelo. In 2003, Frank was working with a new rootstock called ASRT(African-Shaddock-Rubidoix-Trifoliate). Even in his 80's, he was still working full time and looking towards the future. Frank took great pride in his work, and truely loved what he did. He was a mentor to many in the citrus industry and had many great accomplishments over the span of his career. The farming operation as well as a new nursery continues to operate, and we look forward to farming in the 21st century, and thank our parents and grandparents for their dedication and hard work. We look forward to what the future holds and hope to continue for another 80 years! 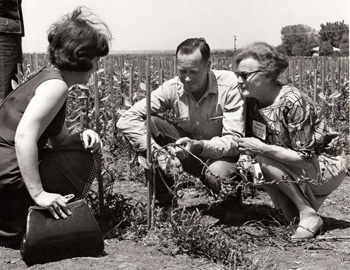 Frank giving a tour to Canadian journalists for Sunkist in 1966, during a statewide tour of citrus. His house can be seen in the upper right hand corner. BELOW: Frank and the parent Pummelo tree on the original ten acres. 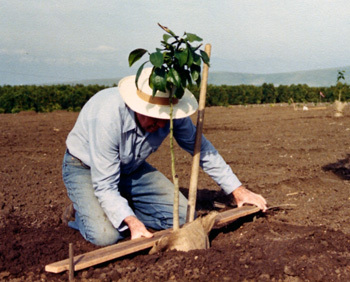 Frank planting his first Star Ruby grove in 1985.